OS X seems like it has a keyboard shortcut for just about everything, and you can change most of them if they don’t suit your tastes. If you want to launch an application using the keyboard, however, you have to use add-on software. Quicksilver has long been viewed as a viable Spotlight alternative, but it can do a great deal more than that as well. Billed as a productivity app, Quicksilver can let you browse your Mac with keywords, manage content, access documents, music, and even launch applications directly from the keyboard. 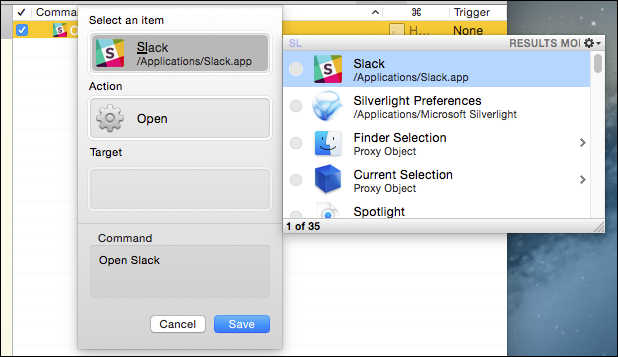 To do this, you have to create what Quicksilver calls triggers, which as you might have guessed “trigger” an application to open with a few keystrokes. This is quite useful if you have an application routine so-to-speak, which you go through every morning at work, or you use a notorious battery waster on your Mac such as Chrome. It’s easy to close Chrome whenever you’re done by using “Command + Q”, and then you can then just open it again later with your own custom hot key trigger. If you haven’t installed Quicksilver yet, then head over the download page and install the version that is appropriate to your OS X release. Once Quicksilver is installed, it will override the normal “Command + Space” keyboard shortcut that opens Spotlight, or you can also launch it from a Dock shortcut or the Applications folder. 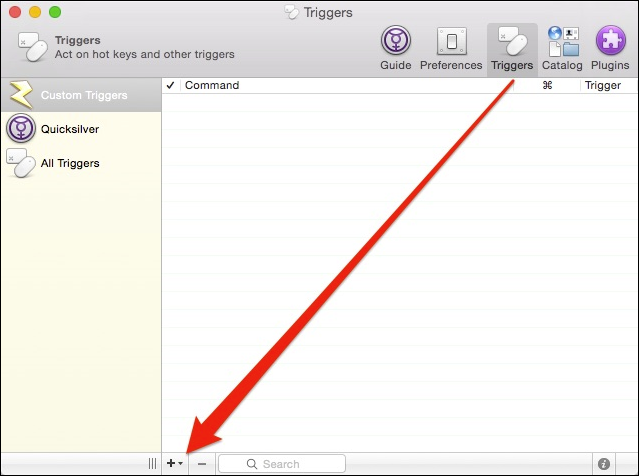 With the Quicksilver application open, click the gear icon in the upper-right corner and click “Triggers” from the drop-down menu. Each item has a keyboard shortcut, which means you can create quick triggers on the fly. On the Triggers panel, click the “+” along the bottom, as indicated in the screenshot below. Each work day, we have several applications that we always open first including Chrome, Parallels, Skitch, and our favorite communication client, Slack. 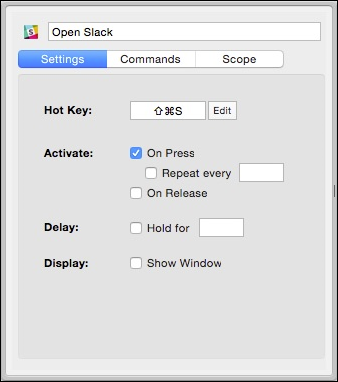 We’ll show you how to create a quick hot key trigger to open Slack. First, in the “Select an item” pane, type a letter or a few letters of the name of your application and you will see a selection of results to choose from. In the following screenshot, Slack is selected and we’ll leave the “Action” as “Open” since that is what we want the application to do. With your application selected, you now need to add a trigger. Click the area indicated in the screenshot below to open the hot key dialog. There are a number of options you can configure, such as whether you have to repeat or hold the keyboard combination. We’re simply going to click “Edit” and enter “Command + Shift + S”. If you don’t like your shortcut or it conflicts with another one, just click the “Edit” button to change it. You can then go through and repeat this process for every application you want to assign a hot key trigger however, make sure you test each combination for conflicts and bear in mind, you might encounter trouble later on. Keep conflicts in mind. For example, in this case, “Command + Shift + W” actually conflicts with a Skitch shortcut, so we’ll have to change our Windows 8.1 trigger. If you ever need to alter or adjust a trigger, you can simply click on it in the “Custom Triggers” pane and do that. Now, whenever you have Quicksilver running in the background, it should intercept your hot keys and launch the appropriate application. If you don’t wish to use Quicksilver, you can also try Alfred, which is a similar productivity app for Mac OS X. Alfred has garnered many favorable reviews but to unpack its full potential, you have to purchase the separate power pack. Quicksilver by contrast, is completely free. We hope you found this article useful, and you’re now able to quickly open your favorite applications with just a few taps of the keyboard. If you have any comments or questions you would like to contribute, please leave your feedback in our discussion forum.